After many months of waiting and some surgical complications, I was fitted with my Mic-key balloon button on the 27th of July. I could not be happier with it. 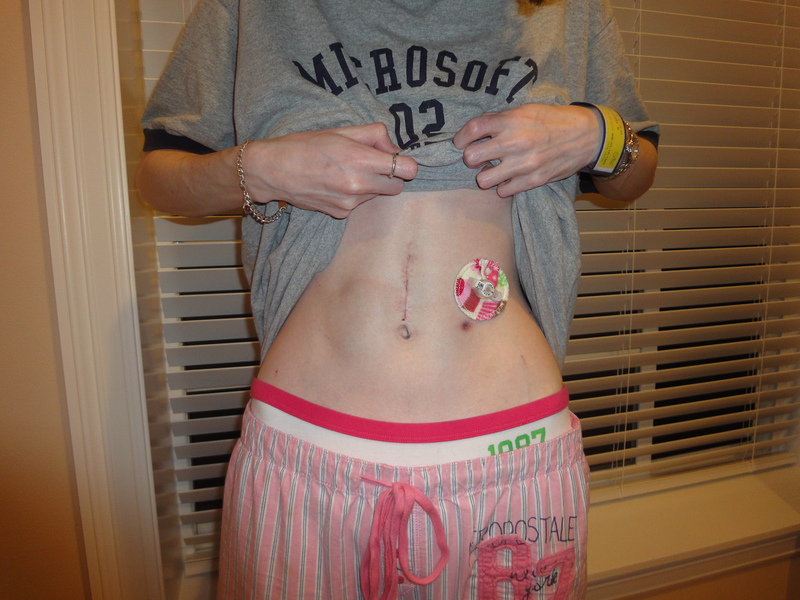 Since my surgical tube was placed so far down my intestine, it was no longer accessible via endoscopy, and had to be changed, placed and measured through Interventional Radiology. 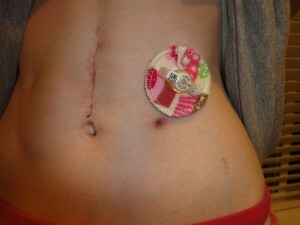 I found out a gastrostomy button cannot be used in place of a jejunostomy. Because the intestines lack holding chambers for food, a long tube with ports or holes must still be used to deliver nutrition via pump. 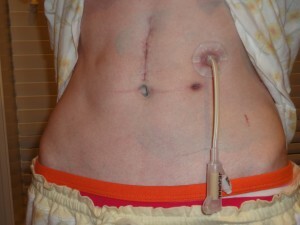 A gastrostomy button has no such tube, so formula fed through it would simply build up beneath the tube site. So the process of getting a jejunostomy button involves 2 parts. First, you must be measured for your button. Depth and width of your stoma is measured to make sure you receive a properly fitting button. To measure, your old tube is taken out. This part excited me because a new shiny tube was put in its place. This is the first time I had an internal bolster that was a balloon. The other two tubes were either held in place with stitches (sucky) or by a piece of plastic. I prefer the non-balloon tubes because there is less movement and I feel they are slightly more secure when you have a 45 pound puppy pulling at it. But after my last attempt at a button, they would not allow anything but a balloon tube/button to be used. After I was measured for my button and the new tube placed (I was heavily sedated for both of these processes), an order was placed for a new button that would fit. 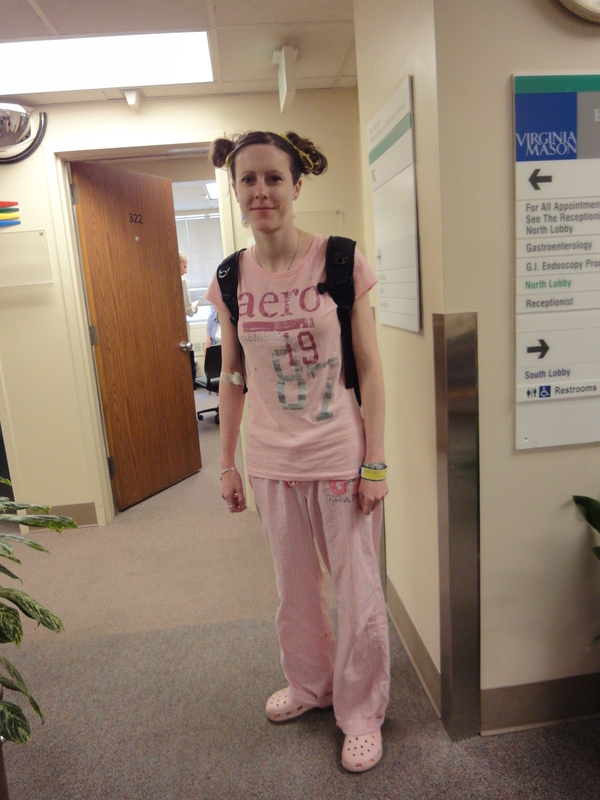 A week later I was back in Interventional Radiology getting fitted for my long-awaited button (heavily sedated again). Only the top part comes out of the body. The rest of the tube is inside. Totally still drugged up but, I love this guy! Walking around shortly after being awoken from sedation. Showing Dr. Patterson my new button! Still blue from that antiseptic stuff and a bit swollen but it is still pretty! It took approximately 1 hour for the procedure with another hour of recovery. There was very little pain experienced and anything I did experience I attribute to the fact that it was the first time I had a balloon in my intestine. If anyone is considering switching from a tube to a low-profile button, I 100% recommend it. My jejunostomy stoma is no longer infected and the granulation tissue seems to be well under control, if not completely gone. I still continue to have normal leakage from the tube but it is clear and slow. I attribute this leakage to a tube that has a loose fit. I don’t mind the fact that it is slightly loose as it allows for the tube to move around a bit when my intestines are moving. A little give in the tube keeps me from possible pain. I am almost completely comfortable at night, sleeping on my stomach (and button). I do not feed during the night still as I feel that 1. it is more normal to feed during the day like you would if you were eating orally and 2. it is more uncomfortable when the connecting tube is hooked up at night and I am trying to sleep on it. That is just my personal experience. Most everyone else I talk to, are night feeders. It is all about personal preference and what works best for you. Through trial and error, you’ll figure it out. My wife has one with the balloon in it. And has nothing but problems with it. it is extremely painful for her. Where did you have the surgery done. And how can my wife get one of the buttons. I had my surgery done at Virginia Mason Medical Center under the supervision of Dr. David Patterson. However, he is now seeing patients at Swedish Medical Center in Seattle. 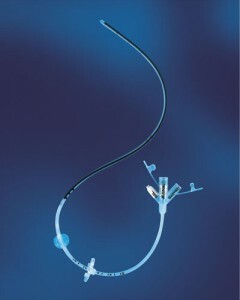 Button tubes are done at the request of the patient and are special ordered and placed by an interventional radiologist. At least, that is how it is done here. For further information, I would contact your gastroenterologist. All buttons are held in place by balloons, so if she is having issues with balloons now, getting a button might not help her problem. Taking some of the fluid out of the button might help – but again, I would look to your gastroenterologist or primary care physician for help with that. I have a balloon jtube. It has been in for a year and apparently I will never eat again. My home nurse thinks a TPN would be better. I have pain,, excessive leakage and terribly erroded skin. I have Diabetic GP and am 38. I have seen many dr’s with same response. “Sorry, we can’t help you.” Ahhh!! I see Dr Patterson for severe Gastroparesis- i had the stomach stimulator (pacemaker) implanted, im at the maximum current allowed for the unit and i dont know if its working, Dr Patterson says it is but i still feel crappy alot of the time! 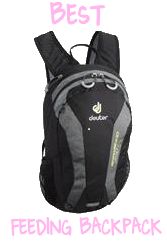 I bolus or pump feed during the day– i try doing it at night but its so loud that i cant sleep! The stimulator actually DOES affect heart monitor tests! I was fine before i got the implant and now all i have is problems with the heart testing that they do in the ER! Dr Patterson is so awesome- very friendly, really listens and answers all my wuestions… I have him a 5/5 stars and his New Zeland accent (sp) is pretty cute! Sorry if this is sort of long and slightly side tracked. I have just gotten out of the hospital and I’m recovering at home due to the safety of your home vs. in the hospital where all the sick people are. Can’t take the risk. Sorry if this post is all over the place. I’m still recovering from an unknown reason for an extremely high HR, so I get tired easily since my heart is beating at the rate a track runner doing the 100m dash. I see a cardiologist tomorrow to see how next to proceed. The idea of placing a pacemaker to control my heart. If it works, I can resume all of the things I used to do before my last admission where I got real seriously possible, life threatening issues with my heart. Horseback riding, rock climbing, etc. I know I’ll get there. This cardiologist has my hope in that he will finally be the one to see how everything is connected even if on their own, look to be a lot of single illnesses. I do not have many options left at the moment so he has quite the challenge once I come walking into my appointment. Good luck to him and help make some things better or simply diagnosed that can validate some of my concerns.